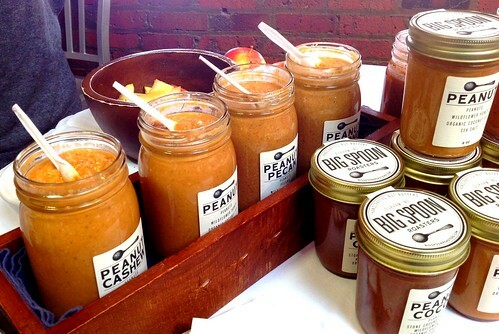 Big Spoon Roasters – Nut Butters Handcrafted in Durham! Mark Overbay founded Big Spoon Roasters in 2010. He has always had a passion for food and his interest in making nut butters was sparked by his time and experiences in Zimbabwe as a member of the Peace Corps where he witnessed locals harvesting and roasting nuts to mash into nut butters to eat. His experiences there made him think about peanut butter in a different light with the realization it didn’t need to be an overly sweet product with a bunch of fillers. He began tinkering with recipes using simple natural ingredients when he got back to the states and the rest is history. When they aren’t busy making their nut butters and energy bars and shipping them off to over 90 retail locations throughout the Triangle and the country, you will often find Mark and his wife Megan at the Carrboro Farmers’ Market Saturday mornings selling their handcrafted creations. I’ve stopped by their table at the market a few times now and always enjoy talking to them. They typically have several of their nut butters on hand to sample and purchase. I am a creature of habit and so far I have only tried their classic peanut butter (I am boring I know) and I love it. It isn’t a sugary peanut butter and it doesn’t have a bunch of unhealthy ingredients like the stuff you typically find from national brands. 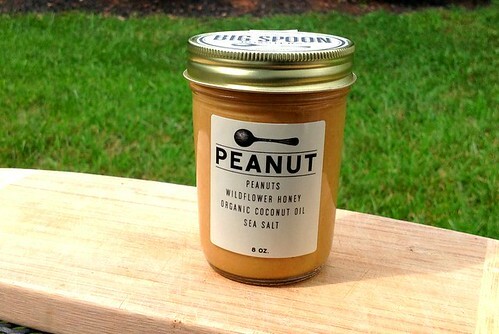 Big Spoon’s peanut butter is made with simple ingredients local and regionally sourced peanuts, wildflower honey, organic coconut oil, and sea salt make. That’s it! The peanut butter has tiny bits of nut chunks giving it great texture with just the right amount of sweetness from the wildflower honey. 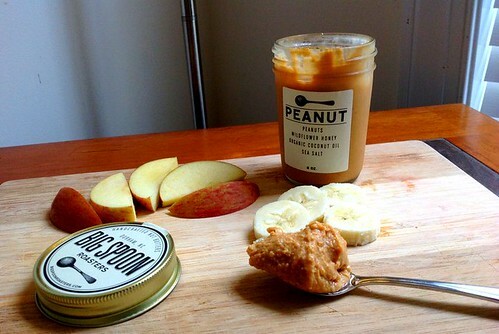 My favorite way to enjoy their peanut butter is by spreading it on a fresh crisp North Carolina apple. 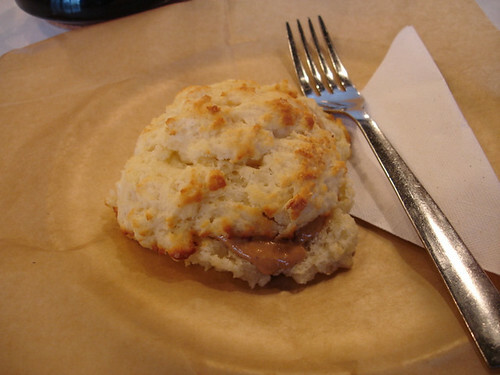 I also love having the peanut butter on fresh made biscuits at Jubala Village Coffee. It is such a great combo and makes for a perfectly sized snack to go with my morning coffee. In addition to the classic peanut butter, Big Spoon offers a variety of other small-batch butters, made from other nut varieties like pecans, cashews and almonds. They also have a peanut butter mixed with stone-milled dark chocolate (I recall now having tried a sample of this too at Jubala and it is awesome!). Their newest creation is a Chai Spice nut butter made with a blend of cardamom, cloves, ginger, cinnamon, vanilla, and black pepper, that is mixed with fresh-roasted, freshly milled peanuts and almonds and local wildflower honey & sea salt. I think I may need to try that one next! If the pictures and descriptions above haven’t made you hungry yet this last one should do the trick. 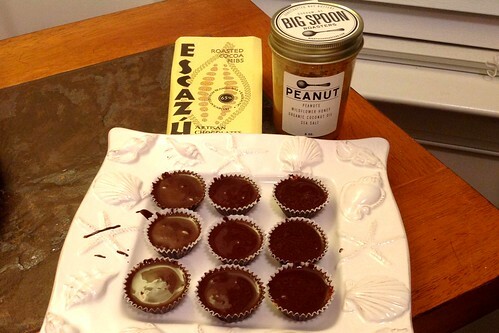 Last winter I experimented with making homemade peanut butter cups by melting down locally made chocolate from Escazu in Raleigh and filling small paper cups with a dab of Big Spoon peanut butter submerged in the melted chocolate before chilling them in the fridge. The results were heavenly. I had planned to give the peanut butter cups away as gifts but they didn’t make it out of my kitchen because of my sweet tooth. If you get a chance I highly recommend you pick up a jar of one of their nut butters to try, they also make great gifts for foodie friends. A list of local retail locations carrying their products is shared below. 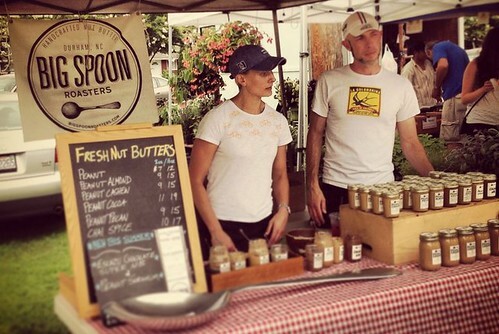 To learn more about their different nut butters offerings visit the Big Spoon Roasters website here. Enjoy! Where can you buy it in the Triangle? Mark is a great guy, and Big Spoon makes great products. The chai spice nut butter on apple slices or toasted bread is awesome. It really is the best peanut butter I have ever tasted! One bite of it slathered on a waffle at Jubala & we have been hooked. I can’t wait to get my hand on the Chai Spice…I’ve heard it’s amazing. Yes! I really need to try the Chai Spice. Everyone keeps telling me how awesome it is!